I love the clown shot! I love the colors! Great job, Tracy! Which polaroid film do you use with your Tektronix ? My Tektronix came with the standard 3.25×4.25 Polaroid back. Any of the Type 100 Polaroid pack films will work. Fuji FP 100C pack film, will work as well – not to mention, it’s readily available and much cheaper! I forgot to mention that Type 80 works, too. I used Type 80 Viva Color for the shots above. Keep in mind, type 80 is a smaller, square format so the fit is a tad off once placed in the camera back. Type 80 film, if you can find it, is pretty expensive. I bought a few packs off of Ebay that had an expiration date of 2008. It may be possible to still find some on Ebay. Thank you Tracy ! Is it easy to use and not so heavy ? It’s fairly easy to use. Mine came with the original manual, but that just confused me more! After a few test shots, I got the hang of it and was good to go. I wouldn’t say it’s the lightest camera….about 7lbs or so! Not a problem for me since I just use it for macro still-life, so it never leaves my house. Hope this helps. Let me know if you have any other questions. Thanks! Here is a photo of my Tektronix camera. 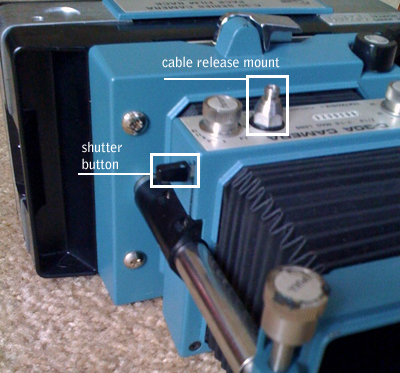 I have marked the ‘shutter butter’ and ‘cable release mount’ in the image. If you still can seem to find your shutter button, there’s a change (given the old age) that the button has broken off. Luckily the Textronix is equipped with a cable release mount. I find that the cable release is usually the best way to go. I bought the Sunpak Cable Release 12″ for $11.95 online from Adorama, though any standard cable release with screw lock will work. Hope this helps. Let me know if you have any other questions. Also, I’d love to see some of the photos you take with your Tektronix – that is, once you get it up and running! I just discovered this camera in our attic. I was wondering how can i use it. I cant seem to find the view finder (if there was one ). I’m just completely lost! Hey! Not sure you’ll get this as I see it’s an older post. But i’ll try anyway… Just picked one up. Long story short, I don’t really understand it. First off, my battery compartment, doesn’t have an wires coming out. I shoot with old polaroids before and I’ve had to convert them before but I don’t see any wires in this camera. Are they supposed to be there? I would assume so. I haven’t used my Tektronix in quite some time. If I recall, there isn’t any need for batteries – as I didn’t need any to shoot with mine. I hope this helps. Let me know if you have any other questions.